· Click on Create Account, fill in the relevant fields and choose a secure Password for your account. 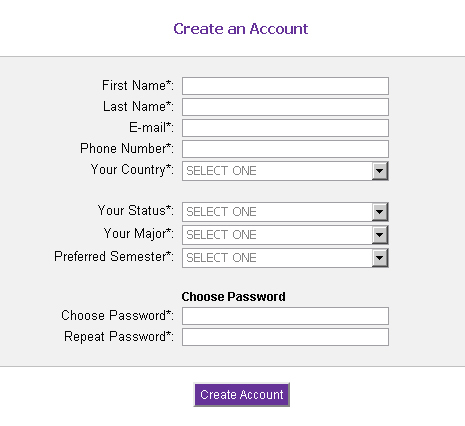 · Fill in all the profile sections listed (Academic Info., Program Preferences, Current Address, etc.). Most sessions are held in ACB room 215. Please click on the "Study Abroad Info Session" tab to the left to view the schedule. The Study Abroad Coordinator meets one-on-one with each student to help them find a program that best fits their personal, academic and financial needs. Before your appointment, research three programs and bring information about the programs to your meeting. To explore a program, please go to the World Map and select the program(s) that interest you. Click on the "Apply" link next to the specific program to add to your Abroad Office account. After a program appears on this page, click on the program title and that will take you to the Provider's page for the program. After you decide which program that you would like to officially Apply to, please do so on the Provider's website. Pay close attention to application dates, cancellation policies, and processes. Each Provider has their own set of procedures to follow. On your Abroad Office account, you MUST go to the "Online Forms" column to begin completing all of the required forms required for participation in Study Abroad. If there are NO "Online Application Forms" listed, then read the program description carefully to get instructions for applying to this program. This is your listing of saved programs. Look under the "Online Forms" column. There will be two numbers indicating "0 out of X". This indicates how many forms are related to that specific application, and how many of those forms you have filled out. Please click on this (0 / X) link to see a list of the forms to fill out. Click on the form name and fill in the form(s) completely. After you are notified by the study abroad office that you have been "Approved" to study abroad, you will then need to click on the link to the specific program and follow the application instructions for the specific program provider or host institution. After being approved you will notice that "Enrollment and Evaluation Forms" have been added to your account under the "Online Forms" column. The Enrollment forms need to be completed before departure and the Evaluation forms once you return. Simply clicking the "Apply" button from this website does not complete the application process. It is your responsibility to make sure you fill out all required application and enrollment materials for the provider for the program you wish to attend.